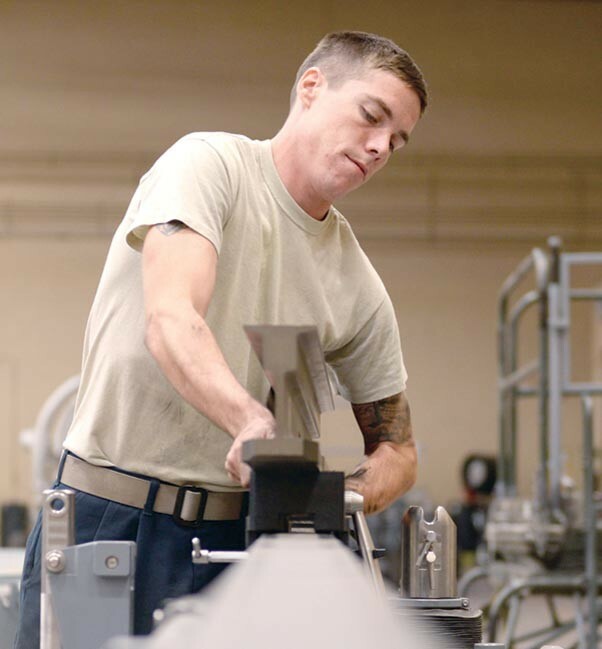 Senior Airman Roger Combs, 61st Aircraft Maintenance Unit maintainer, works with equipment designed to help disassemble F-35 Lightning II components. The 61st AMU handles the hands-on practice phase of the training that some Hill Air Force Base, Utah, maintainers undergo at Luke. Airmen from Hill Air Force Base, Utah, finished advanced training on maintenance procedures for the F-35 Lightning II Nov. 3 at Luke Air Force Base. The Hill Airmen are part of a continuous cycle of maintainers being sent to Luke from Hill in order to develop their skills in two phases of training, first under the experienced academic instructors of Detachment 12, 372nd Training Squadron, and then through actual operation and practice on the Luke flightline with the 61st Aircraft Maintenance Unit. As part of the mechanical transition training program, the Hill maintainers who arrive here all have some degree of previous technical training and are ready to learn the skills needed for them to be mission-ready on the F-35. The crew chief course under Det. 12 is 30 academic days in length. Students typically undergo three days a week of classroom instruction, where they learn the theory of operation for the airframe, electronics, hydraulics and other fundamental systems, and two days a week of hands-on learning with actual aircraft. Following completion of their academic phase, students are handed over to the 61st AMU, who train and provide them practice for two weeks on the basic crew chief tasks needed to start working as soon as they get back to Hill. 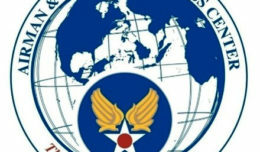 The students who arrive are mostly experienced maintainers who have worked previously on legacy jets, such as the F-15 Eagle and F-16 Fighting Falcon. This experience allows the students to transition into the F-35 program with an understanding of the work ethic and operational pace expected of them. However, the added experience also poses occasional problems. 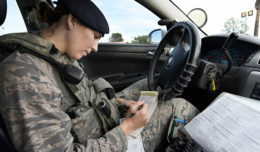 Bethel says the instructors counter this problem by pushing their students to exhibit excellence and integrity in respect for the role they’re playing in shaping the future of the Air Force. Carson also echoes the importance of what the maintainers are learning.